So I've been obsessed with Doctor Who recently and BBC has been playing all the reruns from series four which I record and then watch for hours. Now that all the shows have been watched, I just realized that the Doctor isn't on quite as often as every day...BOOOOO!!! This new season is the last for David Tennant (love him!) and the new Doctor will be Matt Smith (don't know him). 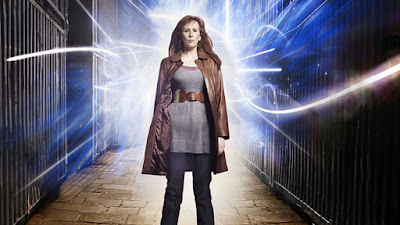 BUT the saddest news for me is that Donna's days with the Doctor are over! Of course, everyone in the UK already knew that but I just watched that episode the other day and it was SAD! She is totally my favorite Doctor Girl! She was so normal and really funny and she didn't totally fall in love with the Doctor (like the other two). Maybe some therapy or a support group? You can do it! You can survive! Don't you just have favorite TV show withdrawl? oh dear. That sounds like it will be rough....Recently I've become mildly (actually insanely) obsessed with the book "saga" by Stephanie Meyer..."Twilight" and following...I'm on my second time through, maybe that's the answer? Watch them all again? I recorded them on my DVR and deleted a bunch to make sure there is space for more shows!! But I kept some of my favorites so I'll just keep watching them. I did look up the series on Amazon and each season is about $70!! That is seriously crazy! I know what you mean...I got hooked on HBO's Deadwood series, ahve been waiting two years for a season four. Hasn't happened. I'm pining...wishing for more! Funny how we get hooked?